SpongeBob SquarePants is back with an undersea diner twist! Mr. Krabs is expanding his Krabby Patty kingdom one restaurant at a time. But he needs your help! Slippery sturgeon, antsy anchovies, and even Bubble Bass the restaurant critic keep everybody's most beloved fry cook -turned-server on his tip-seeking toes. With 50 levels of culinary chaos in five unique underwater restaurants, it's up to you and SpongeBob to seat, serve and satisfy even the squirmiest of patrons. Don't miss special guest appearances by your favorite residents of Bikini Bottom. Soak up a five-star feeding frenzy with everyone's favorite sponge! 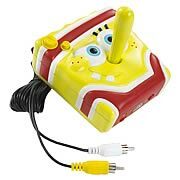 Spongebob Squarepants 5-in-1 TV Game. 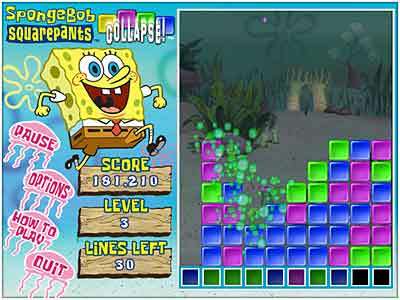 From the shores of Bikini Bottom comes Spongebob Squarepants 5 In 1 TV Game! Compact and fully portable, TV Games allows for easy, instant game-playing fun by offering multiple video games in just one authentic controller. The SpongeBob TV Game includes: Bubble Pop, The Super Chum Bucket, Invasion of the Hooks, Patrick and the Maze and Sandy's Surf Adventure. All that's needed are 4 "AA" Batteries; no consoles or cartridges are required. Simply plug in the A/V input jacks that come with the controller into any standard television set, turn on and play! Seaworthy adventures for the whole family. Spongebob Squarepants Dilly Dabbler 10-in-1 TV Game. 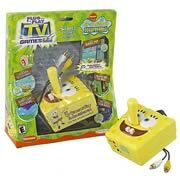 From the shores of Bikini Bottom comes the Spongebob Squarepants Dilly Dabbler 7-in-1 Plug & Play TV Game! The game plugs right into a TV and is ready to play. The joystick contains 7 side-splitting, classic activities that each have a fresh Spongebob twist. Kids can drag "metal" shavings to add a moustache, hair and more to Spongebob and friends in Metal Shaving Makeover, they can draw cool pictures with Gary's gray gooze in Gary's Gooze Art and much more. 10 in 1 equals more fun for the entire family! . All that's needed are 4 "AA" Batteries; no consoles or cartridges are required. Simply plug in the A/V input jacks that come with the controller into any standard television set, turn on and play!